My room is finished! My room is finished! I’m shouting it from the rooftops! My room is finished! With 2.5-year-old twins running around, my bedroom is really the only place in the house that is all mine. I decided that it was time I did something nice for myself. I’m considering this room to be my Mother’s Day present to me! 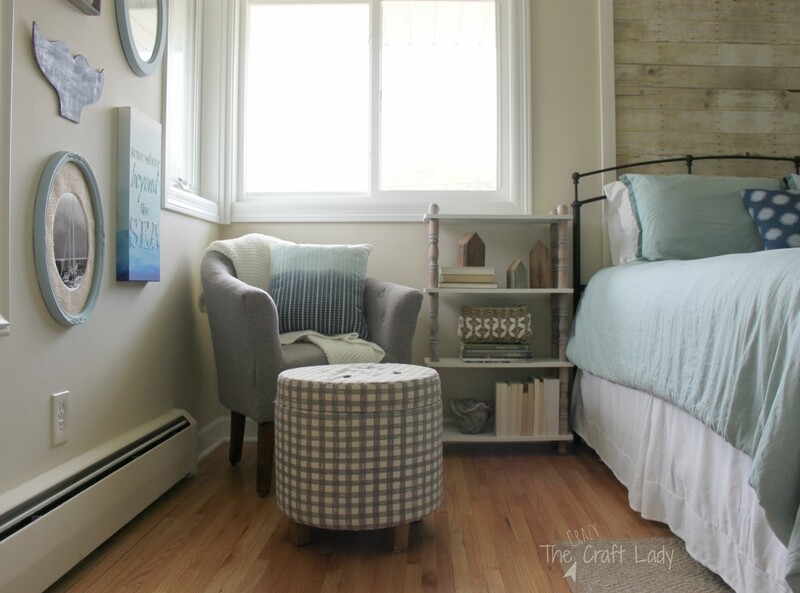 I recently heard about the One Room Challenge hosted by Calling it Home. The Challenge gives you six weeks to transform a space. Six weeks. There’s nothing like a challenge and a hard deadline to keep you on track! So that was the start of the inspiration for my bedroom’s mood board. 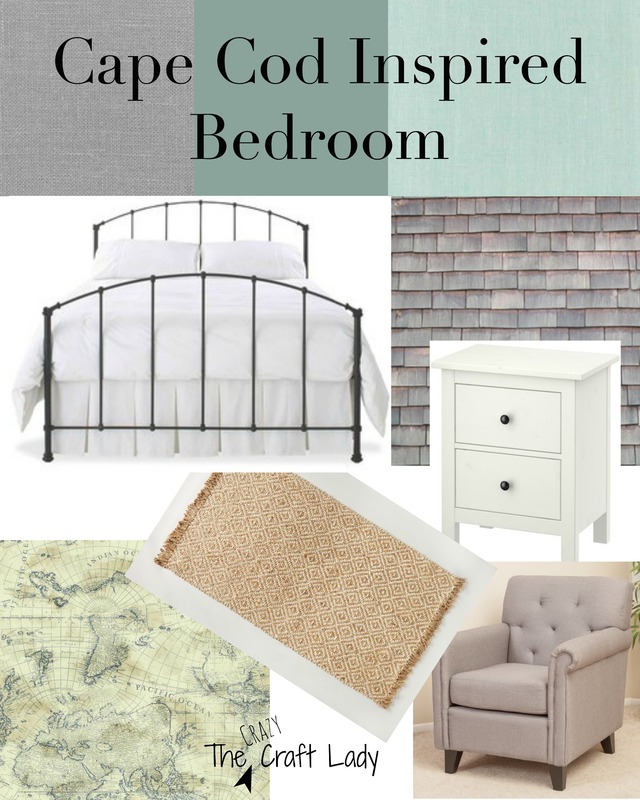 In week 1, I introduced you to my plan for a Cape Cod themed bedroom. 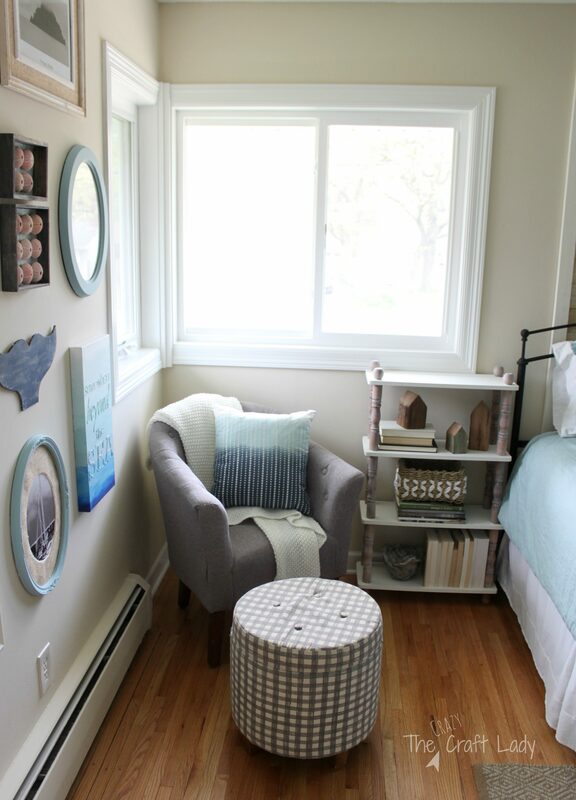 In week 2, I “zoned out and lightened up.” I created a designated reading corner (zone) and lightened up my furniture. 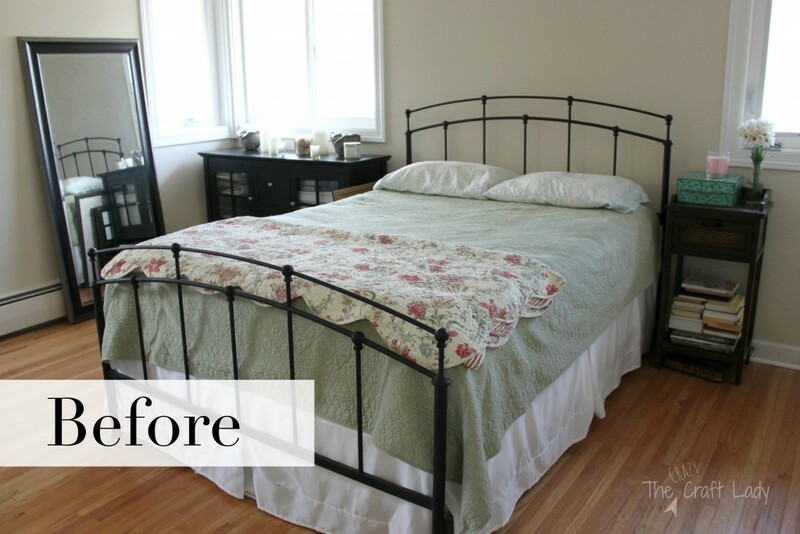 No more black and dark stain… Hello white and bright! In week 3, I got organized. 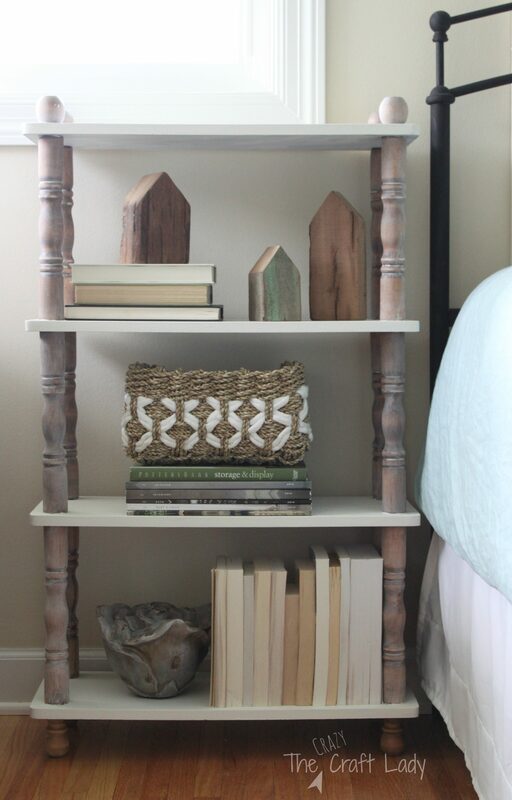 Now that all of my clutter is out of the way, I’m ready to decorate and feel more inspired. In week 4, it was all about my very empty walls and windows. That all changed with some major DIY decor projects. In week 5, I focused on textiles and details. So here we are in week 6 with the big reveal. I’m not going to lie… Up until about a few hours ago, I was still working on last minute details and projects. What can I say? I work best under pressure. Oh, and there is that small detail of it being the end of the semester in my final year of law school. Did I mention that I took my last ever law school final this morning? Party!!! Get ready for the big reveal and a TON of pictures! This room is definitely mommy’s space (note the child proof cover on the door knob). My budget was pretty teeny, so I borrowed items from other rooms, made a TON of DIY decor, and made a few trips to HomeGoods and Target. The duvet and throw are both from Target. 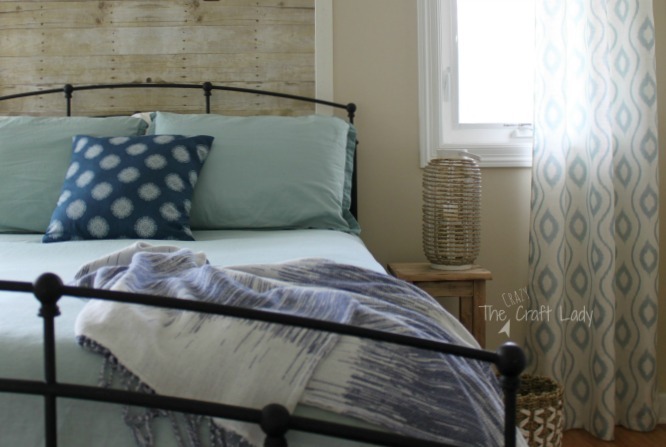 I made the navy pillow using Nate Berkus fabric from Joann Fabrics. The natural diamond rug came from Target, too. When you rent and have an obsession with plank walls, you have to get extra creative. The faux wood panel behind my bed is actually a roll of paper made for teachers to use on their cork boards. Read all about the wall here for the paper source and DIY tutorial. 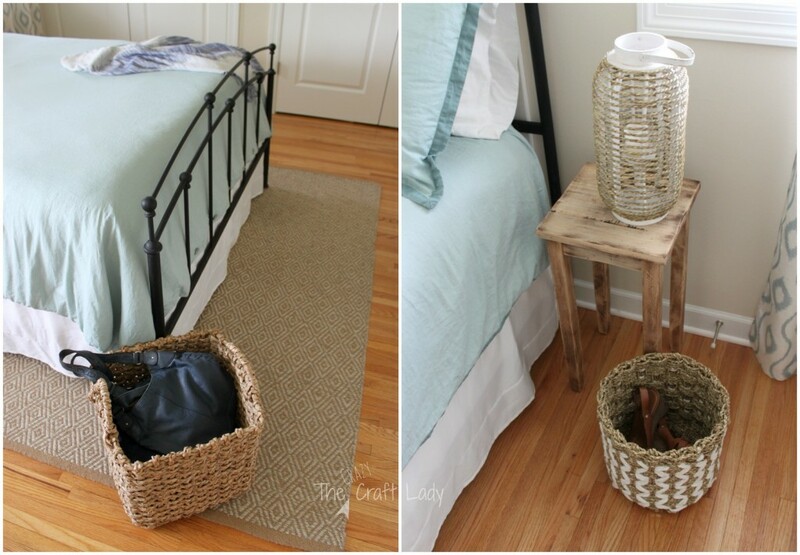 I made use of wicker baskets (Home Goods) – places where I can toss my shoes and purse. They’re definitely not safe in the entry with my twins! I do plenty of reading – both for school and pleasure. I really wanted a reading chair in my bedroom, so I stole the chair in the twins’ room that really wasn’t being used. The ottoman was stolen from the living room (purchased at Target a couple of years ago). The pillow is from Target as well. Shocking, I know. I need a Target-intervention. Then I scored a bookshelf at my favorite thrift store for $7. No, that’s not a typo. I really bought it for $7. A little bit of chalk paint brought the shelf up to speed. Aren’t those little wooden houses adorable? They’re available here. This wall was by far the most work of anything in my room. By using thrift store frames, my own photography, and some DIY skills, I was able to put together this wall for under $50. The photos are my own from a pre-twins trip to Alaska. The buoy patent print is from Zazzle. 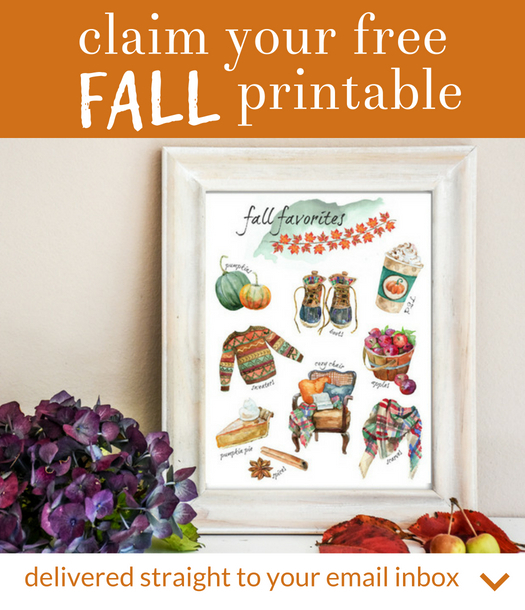 I love their selection of posters and prints. The canvas has a quote from one of my favorite songs. It’s a DIY project using hot glue and acrylic paint. Tutorial coming soon! 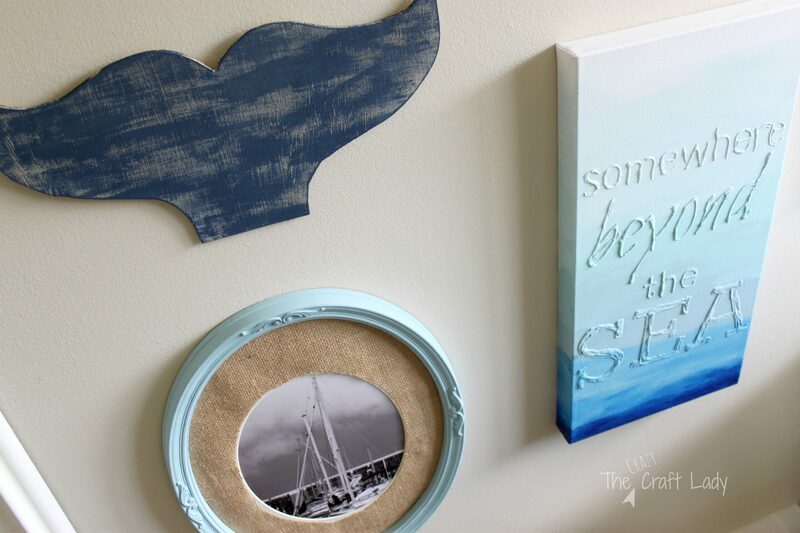 The whale tail is also a DIY-er. 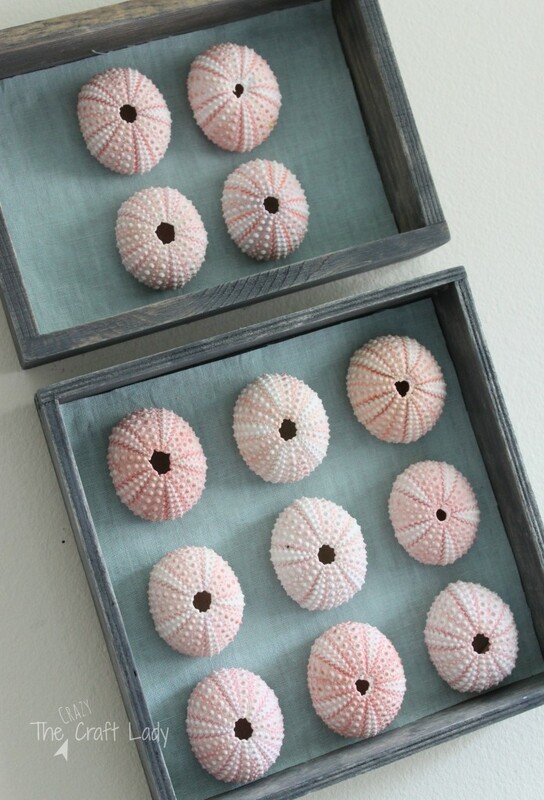 This sea urchin specimen art was a DIY project using these adorable shells – tutorial is here. I got rid of my black sideboard and opted for white instead. I’m going through a major white obsessive phase. This works really well with two toddlers in the house. 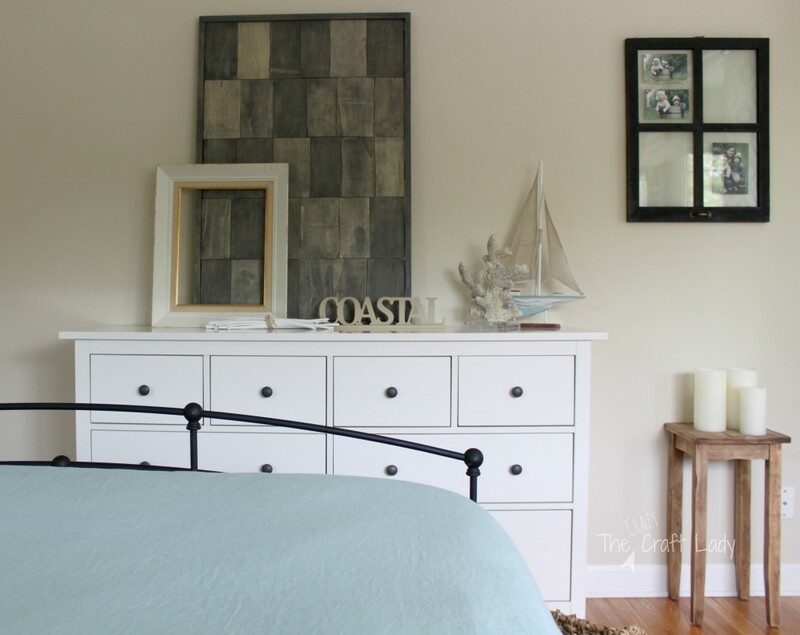 This Ikea Hemnes dresser is such a classic piece at a great price. The Cape Cod shingles inspired art was another DIY project. I cut plywood, stained and framed it. Sailboat and coral decor are both from HomeGoods. 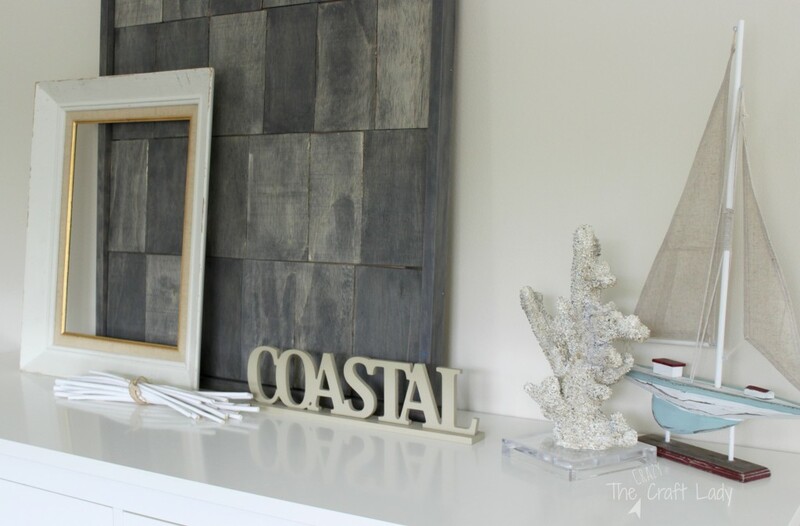 The “coastal” decoration was on clearance at the fabric store… for one dollar! Decorating and DIY-ing were a huge part of this Challenge, but so was organizing. By bringing in the new dresser, I was able to contain much of my crafting clutter that had spread across my room and into the hall closet. That hall closet is my next “big” project, so it was important to clear it out now. My “cloffice” – office in a closet – was finished earlier this year, but I did some major organizing in my clothes closet with storage cubes. It clearly isn’t natural for me to enjoy organizing this much! So there you have it. There were so many DIY projects in this room. There is no way I could do them all justice in one post. Look forward to plenty of DIY tutorials over the summer as I get caught up with writing and editing. Want more room inspiration? 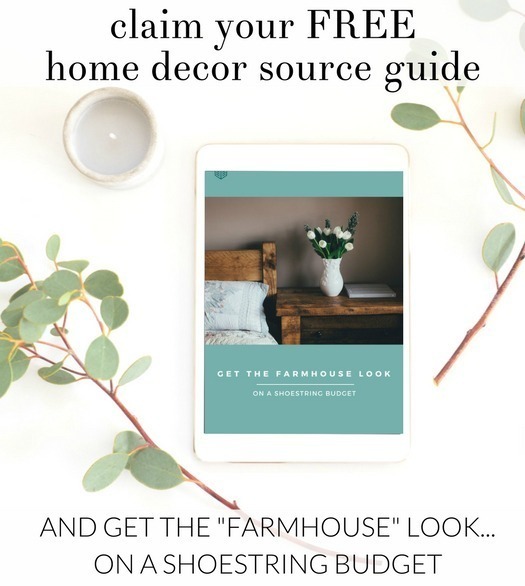 Hop on over to Calling it Home to see the finished rooms from all of the other linking participants. This is by far your best project ever!! Unbelievable. 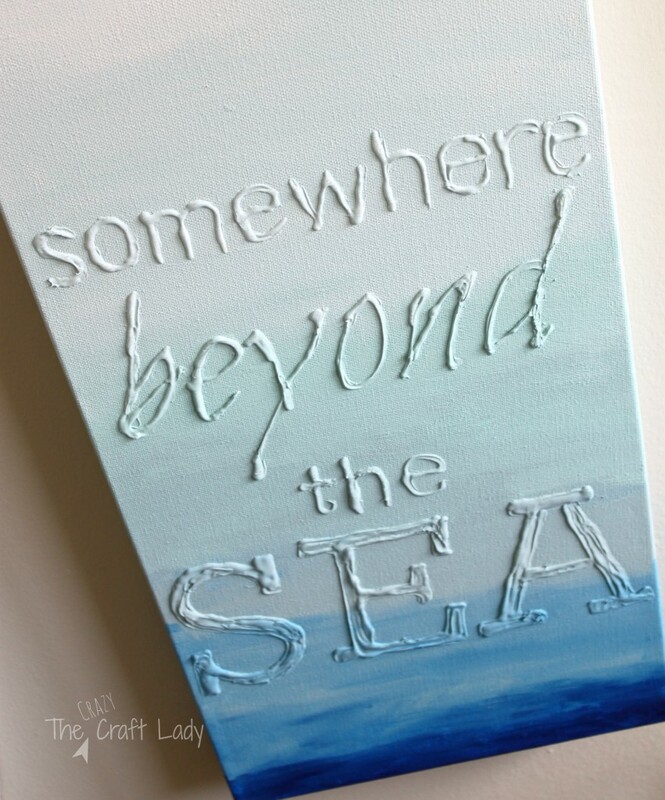 I’m ready for the hot glue tutorial for the “beyond the sea” picture- this would be fast and inexpensive art for our office at work. 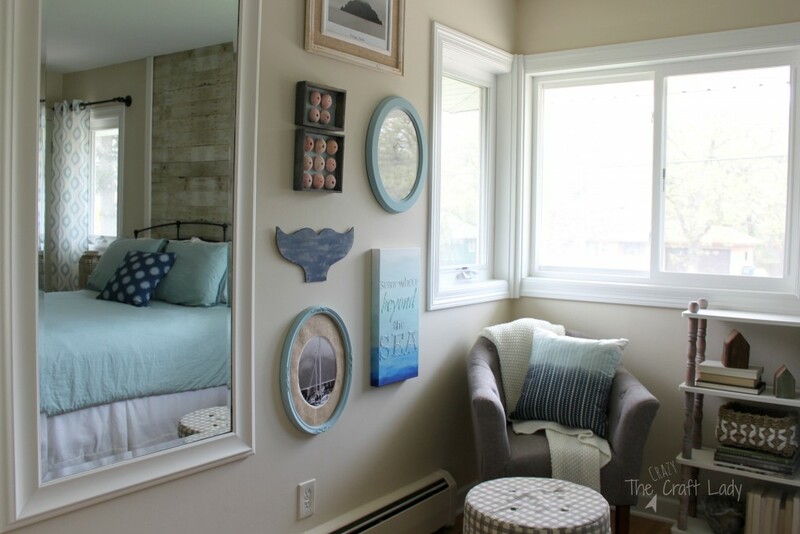 I really like the wall with the mirror – opens your room up so much. I’m inspired by the fabric/pillows……….I need this for my bed, another easy way to ‘liven up’ a room without a lot of time or money. Did you post the tutorial for the sign yet? 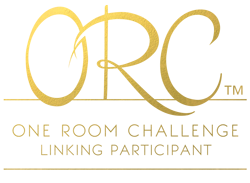 I can only afford cheap artwork…lol I would love to see it! Thanks for stopping by, Ida! I love it!!! It looks awesome, and your CLOFFICE is amazing!!!! Way to go sister!! Thanks Heather! It was a crazy six weeks, but I’m so glad I did it. 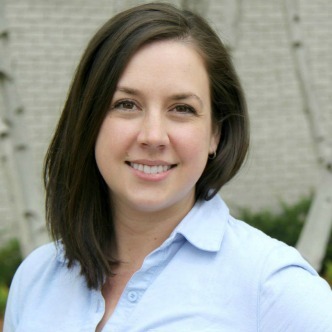 Can’t wait to see your bathroom makeover! Holy buckets! Way to over achieve 🙂 Hopping over now to check it out! I love it all. 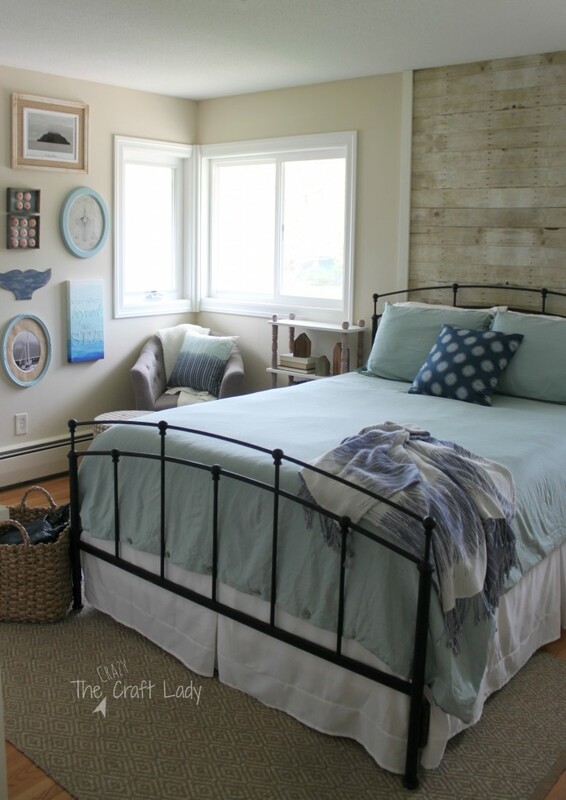 The headboard wall is amazing and the way you accessorized this room is so beautiful. Great coastal vibe without being overdone. The closets are a total dream. Beautiful makeover. Aimee what a huge accomplishment!! Bravo! It is amazing what you can do with imagination and your design aesthetic!! Thanks so much Karena for the kind words. It definitely was an adrenaline rush at the end, but now it feels so good to have everything finished. Thanks Erin! I’m loving my new space. It was pretty before, It’s perfection now!! I’m always amazed when someone says they had a tight budget and it comes out looking this amazing. Looking forward to that canvas quotation tutorial. That roll of paper….genius! It looks so calming and just beautiful. 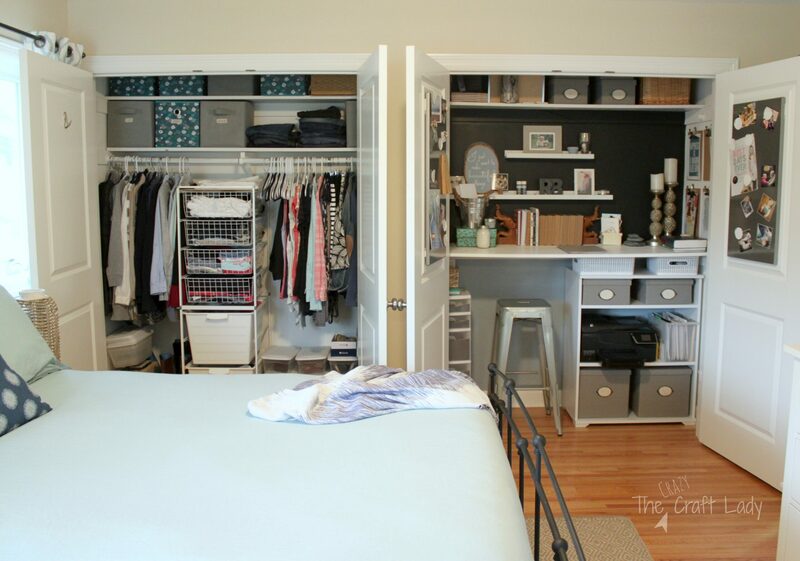 Love the peek inside the closets (you are so organized!). Great job girl! Thanks Ashley! I do love organizing…. maybe a bit too much! 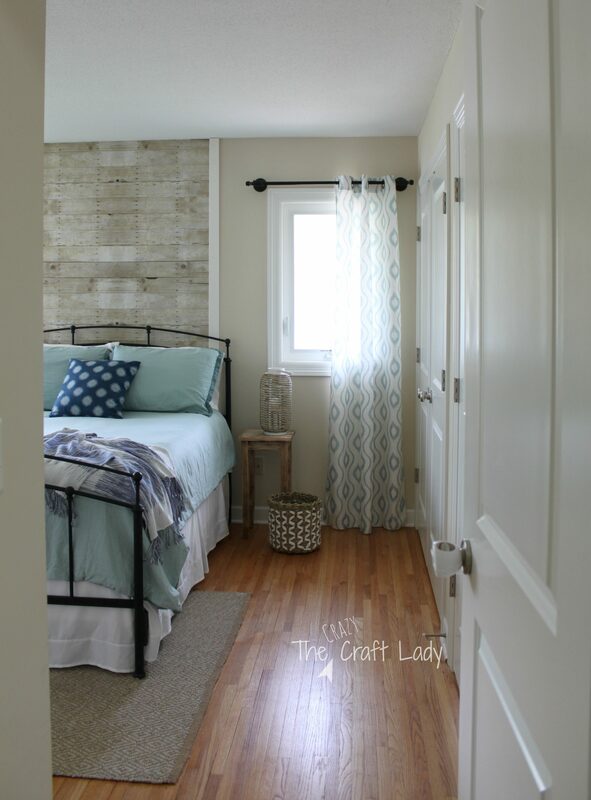 That planked wall, gallery wall, curtain…it is such a nice and inviting space. Thanks so much Delia! It feels so good to have a completed space. So relaxing and soothing – just like the cape! Beautiful! Thanks so much Lisa! I’m so enjoying, and relaxing in, my new space. Amy your new bedroom is gorgeous! 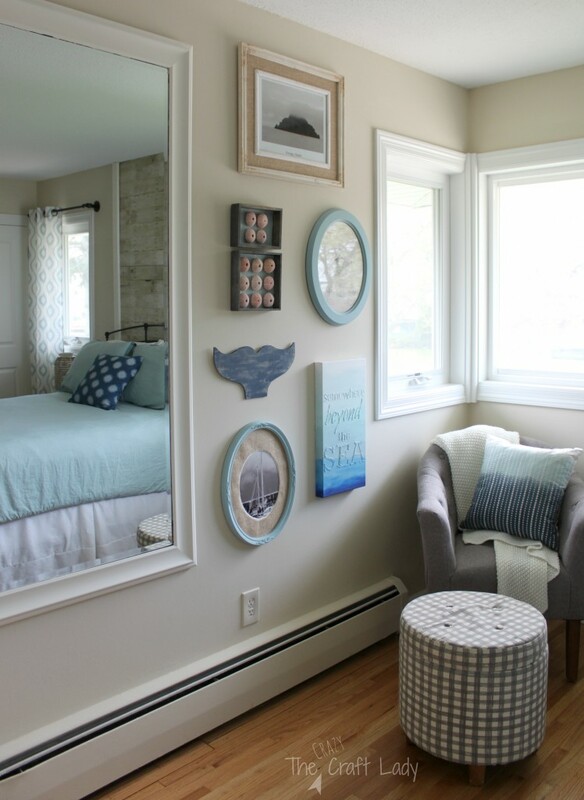 The faux plank wall is GENIUS and I adore your gallery wall! I’m excited for you to have such a lovely space of your own! Love what you’ve done with the room! It turned into such a peaceful, relaxing space!!! Thanks so much for the kind words. Yes, I do feel more relaxed… maybe a bit too relaxed. I slept in until 9 yesterday!! This definitely feels like Cape Cod….one of my favorite places, btw. 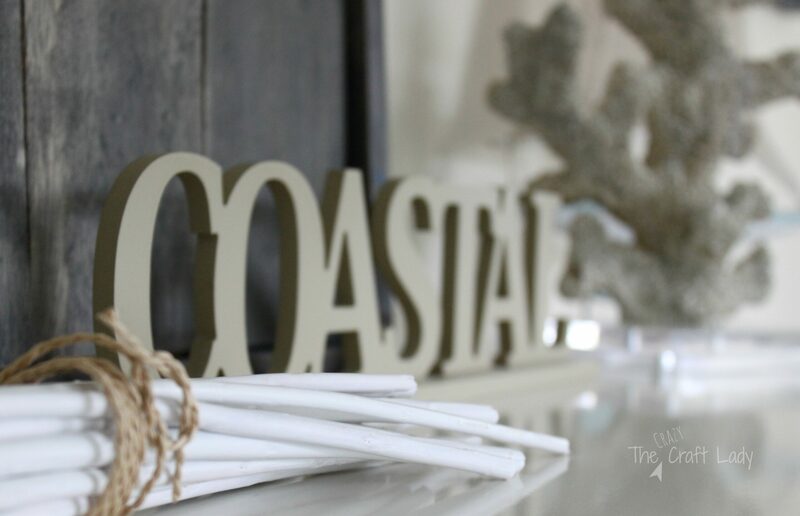 I love all the coastal touches. Definitely a place to relax and enjoy. Thanks so much for the kind comment and for hosting Linda! 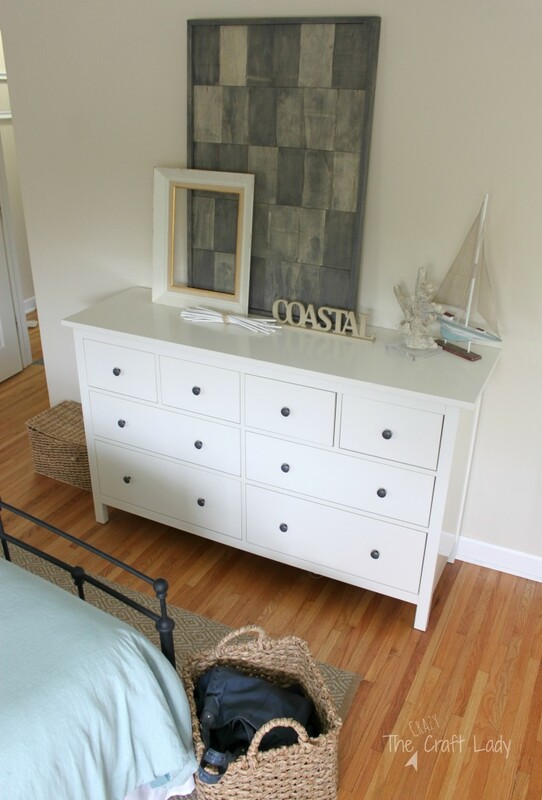 Yes, I love Cape Cod, and since I finished my room I’ve had dreams of moving there… Uh, Oh!! 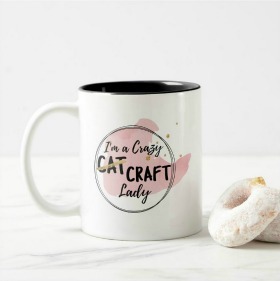 Well….if you really are crazy then I need some of that in my life:) What a creative space so pulled together and functional! 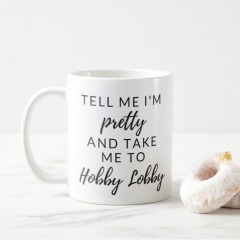 I love all of your scores from Target….my favorite daily place to go! Very pretty room! 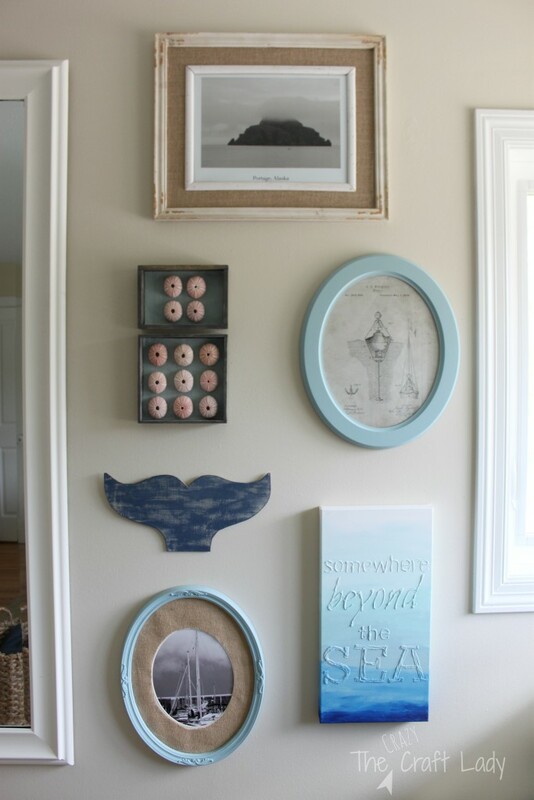 I love the Cape Cod inspiration … and the sea urchin art!! So peaceful! Congrats!! Such lovely colors and I’m jealous of your cloffice! Thanks Jennifer! I “made it work” and love having everything be so organized. Your room turned out so pretty! It looks so relaxing and calm! 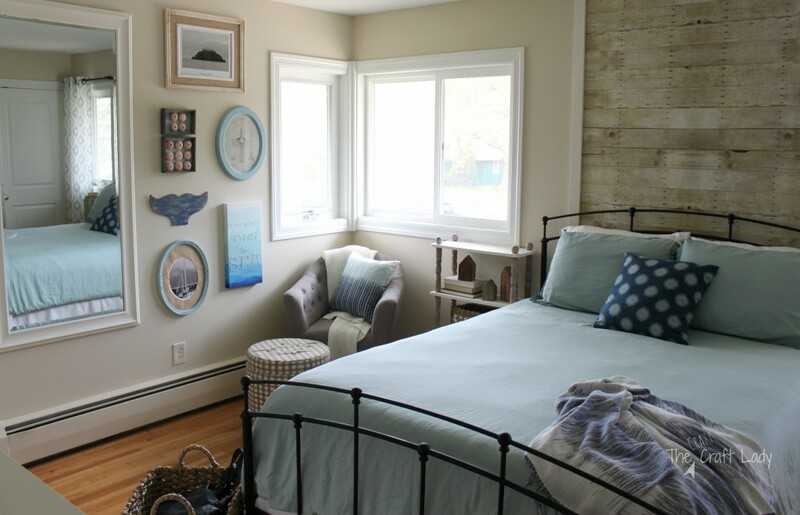 So creative with the “planked” wall too! One thing for sure, I feel so relaxed in your space! Wonderful job Aimee! Love all the pretty little details as well! every detail is absolutely lovely! 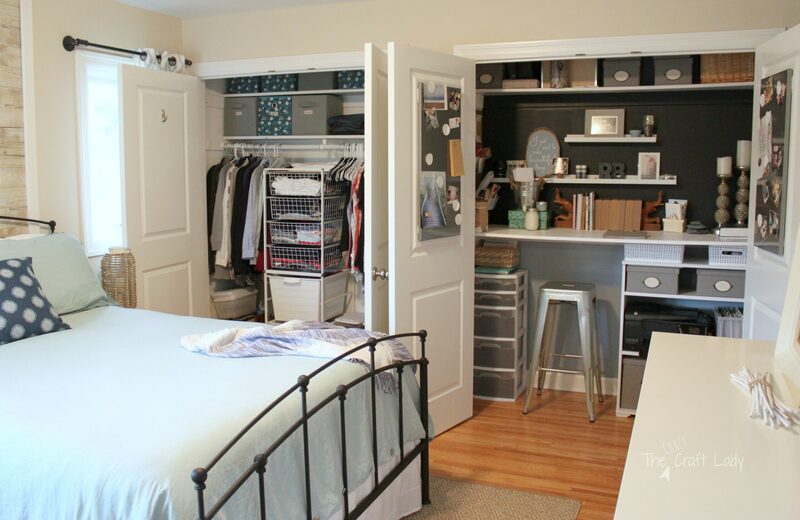 what a bright and airy space…and that closet?! WOW. job very well done!! Thanks! Yes, I do love organized spaces! Your room is absolutely beautiful!!! I am loving your closets! I’m right there with you when it comes to organizing because I have so much fun too! OK so I’m officially in love with your “wood” wall behind the bed, I can’t believe that its paper. Great find. I’m also loving your cloffice. Great job on everything, looks like a lot of work went into pulling it all together in such a short amount of time. I’ll be stealing your basket idea for the shoes and purse. They look so good placed their and very neat and tidy. Thanks for the great ideas and the inspiration. This is gorgeous! 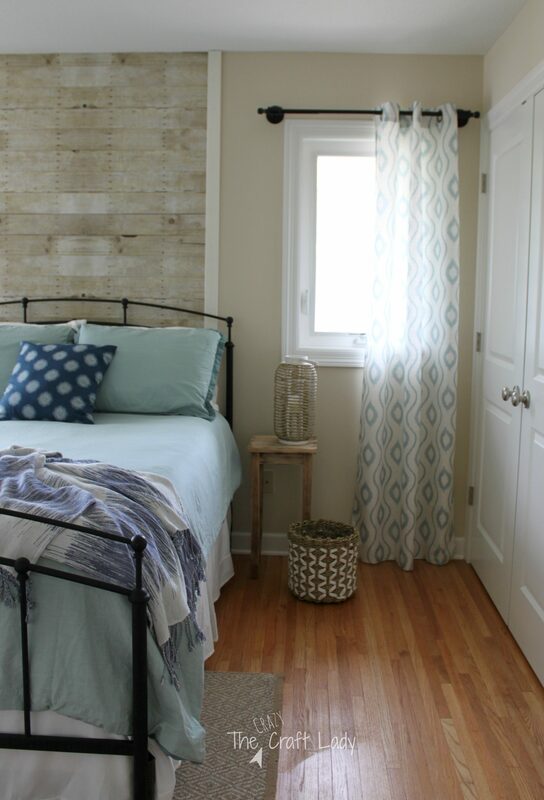 I love the look of your faux wood wall — and your entire room for that matter! And I must say, those are the most organized closets I have ever seen. I have seen this challenge before and would love to try it — maybe one day I’ll muster the courage to submit. 🙂 Great job! I love how it turned out! 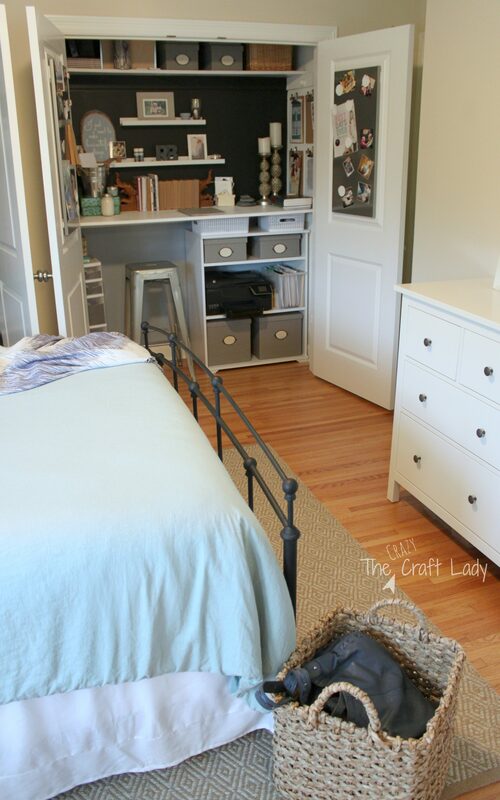 I especially love that closet niche and the wall behind the bed. Very, very cute! Congratulations on finishing law school!!!! And with twins! Stopping by from Friday Frenzy hop. Hope you have a wonderful weekend! How exciting! Thanks for the feature! This looks fantastic! And is also a great inspiration to all of us who are thinking about making a change. I don’t even have the excuse of twins holding me back, haha. Again, great job and good luck with your boards. I have no doubt you will be amazing at all you do!